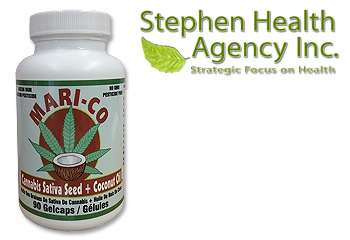 Mari-Co | Stephen Health Agency Inc.
MARI-CO consists of our proprietary cannabis hemp seed oil and organic coconut oil. It provides the perfect ratio of the omega cluster (3, 6 & 9) which mammals require for optimum health, with an exceptionally high concentration of essential fatty acids (EFA’s), which are essential for an improved quality of life. Organic coconut oil is rich in medium chain fatty acids (MCFA’s) which can help towards stimulating our bodies’ metabolism and trimming excess body fat. One of the primary fats found in the unique combination of fatty acids contained in coconut oil is lauric acid, which our bodies convert to monolaurin, and is known to have antiviral, antibacterial and antiprotzoal properties. Organic coconut oil is also rich in capric acid, which shares some of the same antimicrobial benefits, which also may help protect from infections. This super-food combination of our proprietary cannabis hemp seed oil and coconut oil is like a meeting of the Atlantic and Pacific Oceans – a most powerful synergistic combination! MARI-CO is non-GMO, is grown without herbicides and pesticides, and also gluten free. MARI-CO contains 90 gel caps per bottle. DOSAGE : We recommend a minimum of 3 gel caps daily. * You can not overdose. No side effects. Will not interfere with any other medication. Simply click the Distribution link to find a teammate in your area TODAY! Stephen Health Agency Inc., and its thousands of family members, are committed to improving quality of life, one mammal at a time.